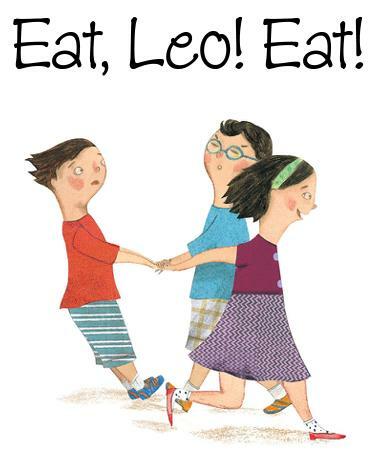 A hyphenated Italian child not wanting to eat his lunch, an Italian grandmother wise with tricks to get the boy to eat, stories to engage the child (and the reader), and beautiful illustrations to engage the eye: what is there not to like about Eat, Leo! Eat? There is also a list of 16 Italian words used in the book, with pronunciation guide and meaning for each word. And a page about pasta, depicting many varieties, giving their name in Italian and providing a pronunciation guide. The author portrays a large, extended hyphenated Italian family enjoying a Sunday meal each week, with the matriarch of the family, Nonna, taking the lead with dealing with difficult Leo. She has the support of the whole family. Psychology proves better at disciplining Leo than any other method. He grows to beg for the stories, which are actually the continuation of one story, while he eats lunch with his loving family. "He's hungry for stories," Babbo jokes. 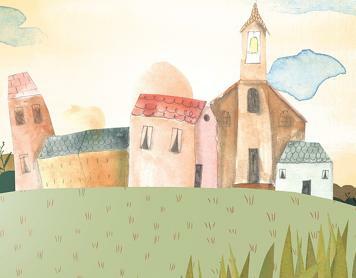 The setting for the story-with-the-story is Italy. Things progress to the point where Leo actually helps with the making of Sunday lunch's fresh pasta. 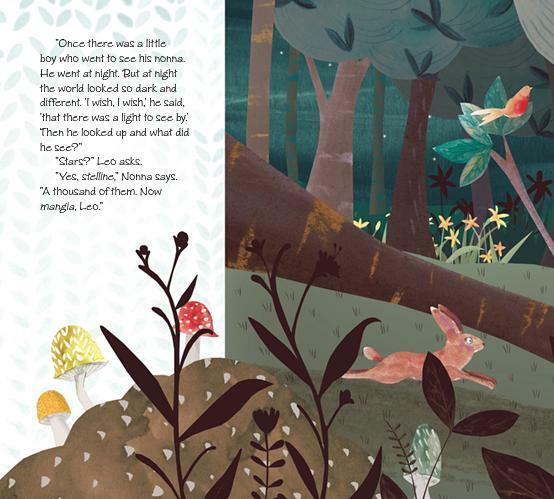 The images offer lots of little details for children to enjoy while the story is being read to them. Even the pasta maker is depicted! 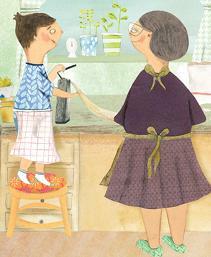 Once there was a little boy who went to see his nonna. He went at night. But at night the world looked so dark and different. "I wish, I wish," he said, "that there was a light to see by." Then he looked up and what did he see?" "Yes, stelline," Nonna says. "A thousand of them. Now mangia, Leo." Leo wants no part of sitting down with his family to eat Nonna's big, delizioso lunch every Sunday. "I'm not hungry," he insists. Not hungry? Hmm. Clever Nonna gets an idea. She'll use a story to lure Leo to her table. And since the pasta in her soup, called stelline (little stars), is woven into the story about a boy who journeys to his grandmother's at night, it works. But again on the following Sunday, Leo doesn't want to eat. So Nonna expands her story, this time adding some chiancaredde (paving stones), the name of the pasta she's serving that day, to create a path for her character to follow. Now Leo's hooked. So much that he begins to badger Nonna every Sunday to reveal more pasta-based details of the story. And week by week, as Leo's relatives crowd around listening to Nonna and teasing Leo to get him to mangia (eat), he slowly comes to realize just how happy he is to have a place at this table. 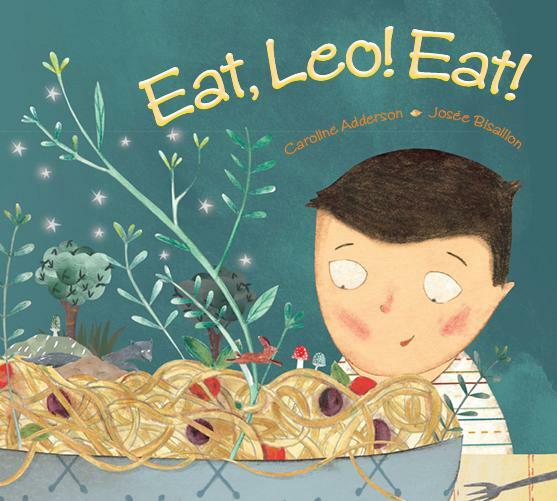 In this heartwarming picture book, award-winning author Caroline Adderson beautifully captures the love and tenderness Leo feels from his grandmother and the rest of his close-knit family through lively, true-to-life dialogue. The playful, detailed artwork by Josee Bisaillon helps bring all of them to life. This book offers a perfect framework for lessons exploring the heritage, customs and relationships of families. The unique story-within-a-story concept, along with the idea that Nonna's tale is being told cumulatively, could easily launch a storytelling assignment. Additionally, the section on pasta and the list of Italian vocabulary words make a great introduction to foreign cultures through food and language. Here is a direct link to the book at Amazon.com.